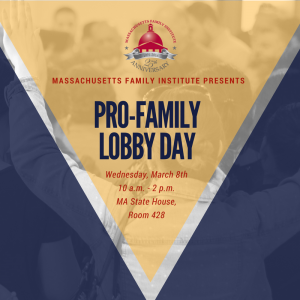 March 8, 2017	10 a.m. - 2 p.m.
For the past month, we have been hosting pre-lobby trainings around the state to help prepare MA citizens for our Annual Pro-Family Lobby Day! Now, we’re only two weeks away, and we’re excited to help mobilize you to be a voice for the family here in the Commonwealth. If you’re able to attend, please RSVP to info@renewmacoalition.org with your name, voting address, email address and phone number. If you are in need of a ride to the State House, we have two buses available. Seating is limited, so please contact Michael King at michael@mafamily.org if you are planning on taking one of the buses to confirm there are still available spots.